Tired of your regular tomato based lasagnas? Heat oven to 350Â°F. 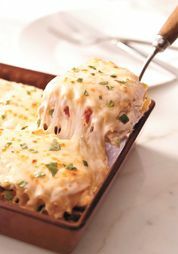 Combine chicken, 1 cup mozzarella, parmesan and tomatoes. Beat cream cheese, milk and garlic powder with mixer until blended; stir in 2 tbsp basil. Reserve half; mix remaining half with the chicken mixture. Spread half of the remaining cream cheese mixture into bottom of 13×9â baking dish; cover with 3 noodles and 1/3 of the chicken mixture. Repeat layers of noodles and chicken mixture twice. Top with remaining noodles, cream cheese mixture and mozzarella; cover. Bake 25 mins or until heated through. Sprinkle with remain basil. Let stand 5 mins. before cutting to serve. Tip â When I donât have any chicken breasts, I simply use minced chicken in the pack. I simply season it and cook, making sure that all the water has dried out. As for the tomatoes, I never use them; so, if your dish doesnât have them, the flavour will not be altered.